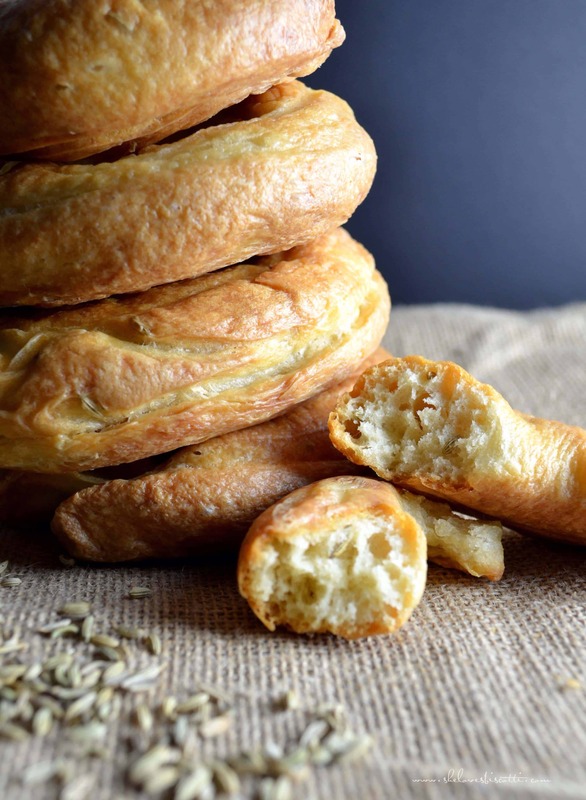 I thought it would be appropriate to share this recipe for my Dad’s Favorite Fennel Taralli recipe on Father’s Day. Taralli (plural) are without a doubt extremely addictive and very unusual as far as texture is concerned. There are many variations of this very simple food to be found throughout the regions of Italy. 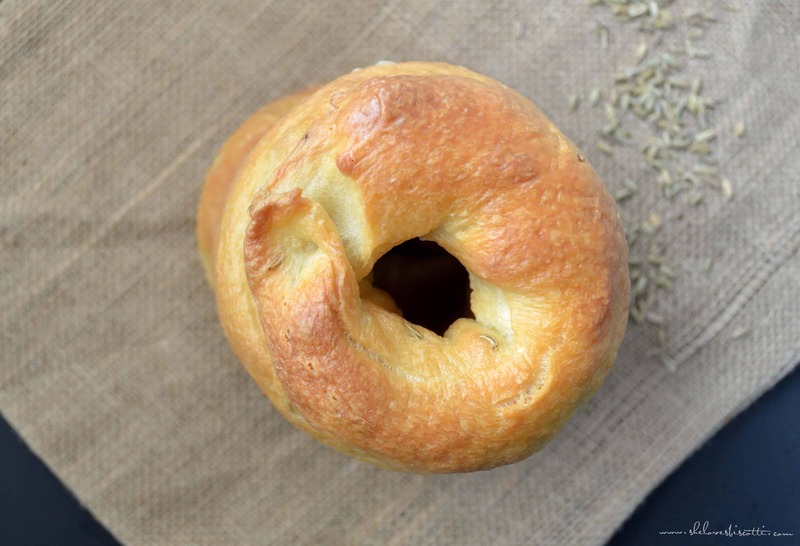 This particular variation is made with yeast and is unsweetened. As with most Italian recipes, these fennel taralli are simple but a little time-consuming. However, they are well worth the effort. 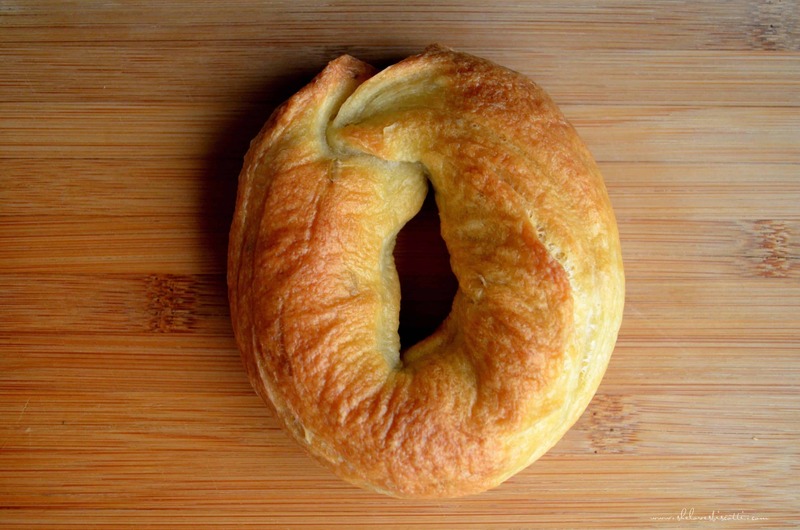 Once you have made the dough and it has been left to double in size (this can take up to 2 hours), you can slice the dough in strips and form them into rings. You can make the rings as small or as large as you like. I usually form them into 7 inch rings; about 1″ thick. Once again, you can make larger (or smaller) rings…it’s really up to you. These taralli get dunked in boiling water, just like bagels, for a few minutes and then in the oven for about 1 hour. When they are done, they become very shiny, and when you taste them, they are crunchy on the outside, soft and chewy on the inside. They are at their best the day they are made. If making a big batch of this recipe, the taralli can easily be frozen. I honestly cannot tell you the exact origin of where my mom got this recipe. I always thought it was a recipe she “created” based on trial and error. The only thing I know is that these were, and still are, my Dad’s favorite Fennel Taralli. My mom would make many kinds of taralli, but a double batch of these would be made religiously every two weeks. They would be kept in the fridge and my dad would have them as an evening snack, while watching TV. I can still remember the set-up. The ginormous wooden board (which I previously wrote about here) would be on the kitchen counter, a large pot of water and one huge mound of flour. My mom would make these taralli manually, no kitchenaid to help in the kneading. That’s what you call a true labor of love! A few months after my mom passed away, I found my mom’s collection of recipes. I was extremely surprised to find this recipe, with actual measurements for my Dad’s Favorite Fennel Taralli in English, and what looked like my daughter’s writing. I knew that because of the frequency that these taralli were made, and the fact that my mom babysat my kids after elementary school; my kids would often participate in the taralli-making process. They would be very proud of the taralli which they made with their grandmother. 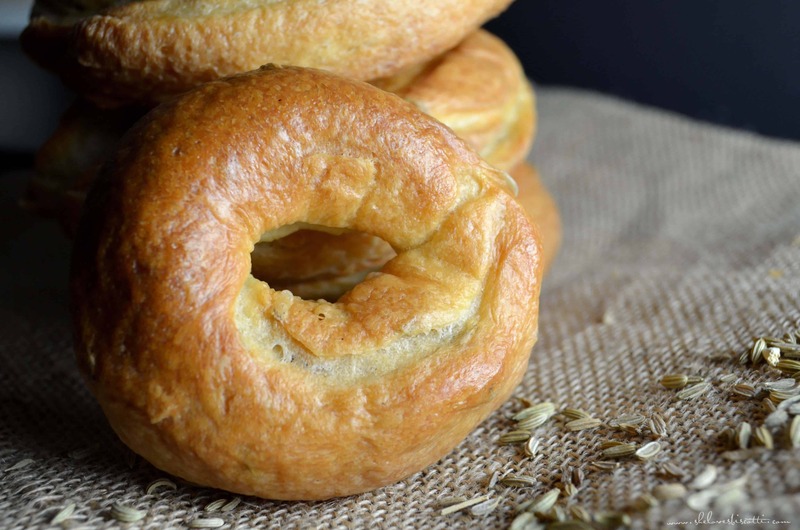 When I questioned my daughter about the recipe, she informed me that she had asked her grandmother for the exact measurements so that she could make these taralli when she got older. And so, thanks to my daughter, my Dad can still enjoy his favorite fennel taralli. Best wishes to all the Dad’s for a Happy Father’s Day! ★★★★★ If you have made this fennel taralli recipe, I would love to hear about it in the comments below and be sure to rate the recipe! Dad's Favorite Fennel Taralli are extremely addictive and very unusual as far as the texture is concerned. Crunchy on the outside and chewy on the inside. In a medium bowl, combine yeast, sugar and water. In the bowl of a stand mixer, combine flour and salt. Add eggs and oil to yeast mixture. Mix to combine. Add this liquid mixture to the flour and salt. Gather dough and place on a well floured wooden board in the shape of a log. Cover with wrap and dishcloth and allow dough to rest until double in size(up to 2 hours) in a warm place. Roll each piece into a 6-8 inch rope, then form into a ring. Make sure that you press the ends firmly together. Plunge the taralli in boiling water; 3-4 at a time. Once they surface to the top, turn them over in the water and continue to boil for 1 minute. The whole boiling process should take less than 2 minutes. Remove with slotted spoon and place on cooling rack to drain. Place boiled taralli directly on oven grates. Bake in a preheated oven at 350° F for 45-60 minutes or until golden brown. (Set oven rack one below the center). These taralli are excellent the day they are made. They can easily be frozen. Up to half of the all purpose flour can be replaced with whole wheat flour. 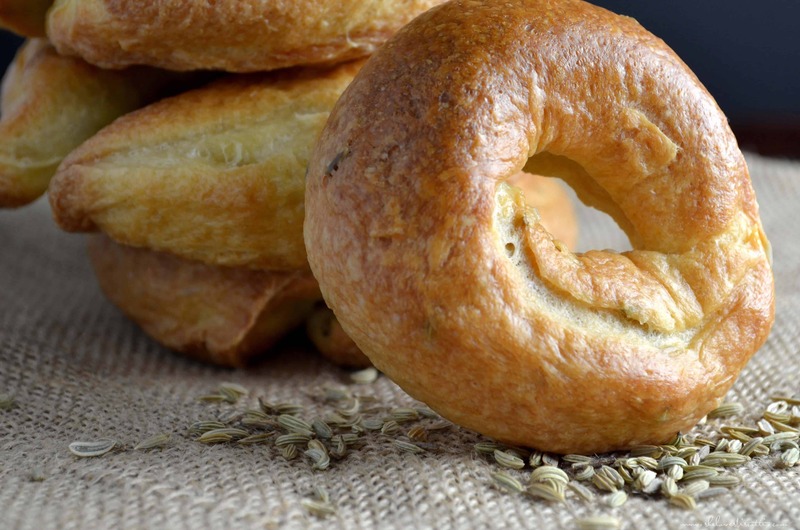 DO YOU LOVE THIS FENNEL TARALLI RECIPE? PIN IT TO YOUR TARALLI BOARD! Maria, I believe this is the recipe I have been looking for the past twenty years. 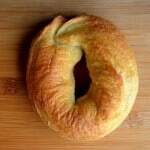 My Mom used to make a dish with the taralli slice bagel style and toasted. She would make up cannelloni beans with olive oil, garlic, salt and pepper and pour them over the taralli. It was a great lunch when I was a kid and I could not find a recipe for the taralli. We used to refer to them as “biscotti” and they were readily available at the Italian bakeries. Today biscotti normally refers to the sweet cookie with almonds. Regis, I am so happy to hear this! I hope they taste how you remember them. Thanks so much for taking the time to comment, appreciate it! first of all thank you for sharing your dad’s recipe. my question am I able to use wholemeal flour and get the same result. Beautiful story, I enjoyed it! Fennel taralli are my favorite; they are what we made growing up with my gram, my mom, aunt, cousin, etc. However, we always let them get hard in the bread drawer or in a brown paper bag, and dunked them in coffee for breakfast or a snack. All the babies in the family teethed on them. Haven’t had one in many years since having to go gluten free, but one will figure out how to make them with the GF flour blend. Thanks for a wonderful memory and Merry Christmas! Thank you so much for your kind words and for sharing Andrea. I agree, there are so many wonderful memories associated with this recipe. I can still envision my mom and my kids making taralli with her when I would go pick them up after work. Thanks so much for taking the time to comment during this busy time of the year. 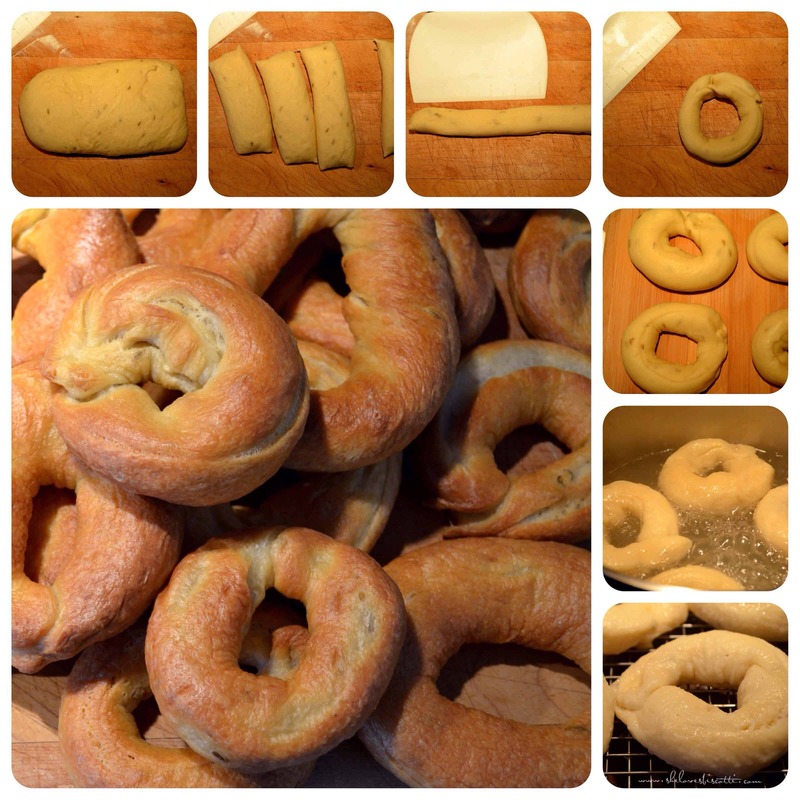 Fantastic recipe for taralli… thanks Maria! Hi. I used to make these all of the time with my Nonna. We didn’t eggs. What would be the difference? Hi Marianna, I love to hear about all the recipe variations that exist in different families. Without the eggs I think the taralli will end up having a paler color and perhaps a different flavor and texture. One is not better than the other… it really is a question of preference and of course the taste that we are used to. Great recipe, thank you for sharing, they taste just like my mom used to make them, Abruzzese style. Quick question, after the taralli are boiled and the first batch are in the oven, what do you recommend for storing the rest until it’s their turn for the oven? At present I just leave them on a towel covered by another towel. Hi Domenic. I am sorry to hear the taralli did not turn out. Let me see if I can trigger something here … did the taralli rest and rise for a couple of hours, after they were kneaded? Did you use regular all purpose flour? Was the dough easy to work with (too stiff? too soft? ) Did you add anything to the water? Do you live in a high altitude area? I guess the taralli had more of a crunch to them, is that right? Did they taste okay or was it “off”? Perhaps one of the readers might have other suggestions.